This model was known as the luxury car with the big back room, due to the large estate area when the tailgate was lowered and the rear seats folded away. This later Super Minx Estate is fitted with a 1725cc engine, a 4-speed gearbox and has covered less than 75,000 miles from new. The Super Minx Estate was classed as a luxury estate car and featured built-in heater, screen washers, safety belt anchor points, padded fascia, dished steering wheel, special sound insulation, all-round vision and superb braking safety. All for a cost of £665 plus purchase tax in October 1961 when it was first introduced to the public. 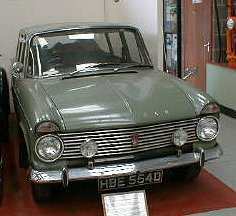 The car was donated to the Museum in 1994 by Mrs N Crane whose late husband had owned the car since 1977. It was used locally and driven on a regular basis. It has a service history which includes the bill from Campions of Lincoln, the main Hillman dealers, for its first service. July 2008 - The Hillman has not run for over 5 years, but has been moved from the display area, so with a battery fitted and a few drops of fresh petrol in the carburettor it 'sprang into life'. Some bodywork will be required i.e. new sills etc plus work on the brakes to put it back on the road. Any help with this would be appreciated. October 2008 - The Minx has left Whisby Road for temporary storage off site. October 2010 - The Minx has now returned to Whisby Road after storage off-site. It will receive a good clean and polish plus some work to the fuel system before going on display in the museum area.